All of his music-education career Bill Brown has been teaching his students to play songs “by ear.” In the early 1990’s he started recording his “by ear” lessons so that his students could take the lessons home and learn more songs at a faster pace. He noticed that this style of learning was of a particular advantage to his visually impaired students. As these “Guitar by Ear” and “Piano by Ear” song lessons became available through mail-order, he added two beginner courses to his line up of “by ear” offerings – ”Intro to the Guitar for the Visually Impaired,” and “Intro to the Piano for the Visually Impaired.” Through the use of these “Intro to” courses a beginning student could learn the basics needed to enter Bill Brown’s “by ear” world, even if this student was visually impaired. Discover what Emily, a little girl who is blind, sees when she watches hers – The Wizard of Oz™. Now, with the first talking guide from XFINITY, millions of people like Emily can enjoy the magic of TV shows and movies independently. 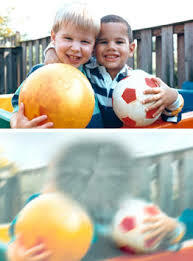 While macular degeneration generally is associated with aging eyes, an inherited form known as Stargardt's disease can affect children and young adults. Low Vision children are especially vulnerable to neck and back problems but any of us who lean over work will eventually pay a very high cost. techniques of introducing young kids to computers and other IT devices. hear the English in the background. 1. The ScripTalk by Envision America-(click on link to open) is free to any person who signs up to use a participating pharmacy. It is a loan, so if you change pharmacies you need to return the device. Participating pharmacies include CVS mail order, some individual pharmacies, and some Wal Mart Pharmacies. You can see the participating pharmacies on the Envision Website or if you go to your local Wal Mart and request they get one, they have been very receptive according to Envision America. 2. Walgreens offers talking prescription labels, they use a different system. The recordable label also has an alarm to remind patients of the time to take their medications. Even if you do not use Walgreens pharmacy they are selling the recording devices with alarms for $10 each. UEB Online is a training program for sighted people to learn Unified English Braille (UEB). Unified English Braille has been adopted by many countries and replaces standard english braille. This program is the first online UEB training tool. The program is suitable for classroom and specialist teachers, parents, teacher aides and other professionals supporting children and adults with vision impairment. This program has been created by the Royal Institute for Deaf and Blind Children’s Renwick Centre. We acknowledge the support and permission from the Round Table on Information Access for People with Print Disabilities and Australian Braille Authority for the adaptation of content from the Unified English Braille: Australian Training Manual, 2013 (edited by Howse, J., Riessen, K., & Holloway, L.). I am presently taking this online class. I like to get the jump on knowledge so I can teach my students along the way to keep updated with braille in general. This class is excellent, self paced…on either a Mac or PC…learning the new Braille code. I highly recommend this great and easy way to learn. When you finish, get the certification you need….and it is free!